I’m pretty new at this BLOGGING so not sure if adding a NEW PAGE is the right way to add a new post. There is also a POST option. Oh well, I’ll figure it out. Today I decided to actually unpack the frames I bought…ages ago actually…and start to create my family wall up the stairs. I’ve visualized doing this for over a year, but wasn’t going to do it in a rush. I wanted all the frames to be black, all the mats to be white and to have chosen really great pictures. I could ‘imagine’ what it should look like. Great faces of my wonderful family. Over Christmas all of the kids were home. It was fabulous. Rachael came first and we had a week just with her. We enjoyed doing adult things and having adult conversations. We loved catching up with her busy life in Florida. Then the Arizona family arrived. Jonathan and Jamie with David ( 4 1/2) and Michael (1 1/2 ). Let the fun begin. ALL of us were together for the second week. We laughed and talked and played many games of Wii and watched a million episodes of Caillou…and TOOK PICTURES.…lots and lots of pictures. Every time one of the boys ‘moved’ it seemed we took their picture. There were cameras all over the house. We used our phones, our IPADS and our ‘good cameras’. We did all that we could to capture the moments and be able to remember then forever. The third week Rachael returned to Florida and we had a second week with Jonathan and Jme and the boys…and yes…more pictures. Jonathan’s a professional photographer and Rach is an amazing photographer and the rest of us just like to take pictures. We did candid shots and photo shoots. We took pictures indoors and outdoors and on outings. We look LOTS of pictures of FACES...close-ups of FACES. It was glorious. 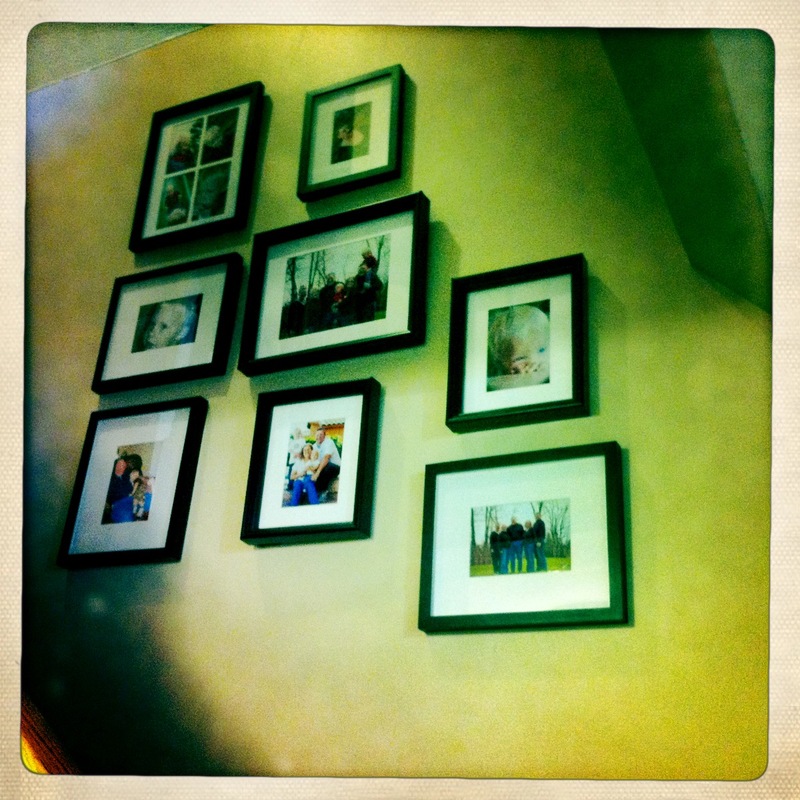 Today I took some of those pictures and carefully put them into my new ‘perfect’ frames and hung them on the wall. With each one I found myself ‘hearing’ the sounds of that moment. ‘Feeling’ the sun on our faces or wind in our hair. I want to reach out and grab each of my kids and grandkids and hold them. I want to tickle the boys and hug the adults. I smile so big my face hurts when I see Rachael’s FACE with a fake mustache or Michael making one of his famous Mikey Faces. Each time I walk up and down the stairs I’ll see those faces looking at me and know that we had those moments and now we have the memories. As I look BACK I know that I have literally closets full of pictures from my heritage, my youth, my extended family and my kids growing up. I have pictures of the places we’ve lived in 29 moves.I have pictures of my parents, my grandparents and my great grandparents. I have a computer hard drive FULL of pictures of everything I do and almost everyone I meet. I LOVE looking back at my pictures. TODAY I took pictures. I was at lunch with some friends and took a group picture. I’ve already emailed it to each person in the photo. I want them to also be able to look and remember that ‘never to be repeated’ two hours when we laughed and talked and got better acquainted. As I look FORWARD I commit to ALWAYS taking pictures. I want to ‘capture’ the moments that make up my life. I don’t even like how I look in pictures most of the time, but when I look at pictures I really don’t see the weight or height or fashion statements of those photographed. What I see are the FACES. Always the FACES. I hope you’re ‘capturing your moments’ and taking lots and lots of pictures. I promise you won’t be sorry…if not why not start today. Maybe you can reply and share a special picture with me. Thanks Barry. I love looking at ‘our’ pictures from the past MANY years…and hope to take MANY MORE. TOTAL AGREEMENT HERE..oh yeah too add to the family talent/love of taking pictures and displaying them and enjoying them.. your niece has been asked to take over the Digital Photography Club ( one of the 3 activitIes she has taken on.) Runs in the family. ps. I even have Grandma Fishback’s suitcase full of pictures and postcards of the cross North America trips she went on. Such fun to look back on. Jan, that is so great about Jules. Perfect fit for her. I really want to take a class to learn more. On my Bucket List! Thank YOU for keeping so many of the family pictures together. Barb – I am just looking at your blog and totally enjoying it! Thank you for putting your thoughts into words in this new form. You have been inspiring and challenging many of us for years and it’s great to be able to continue that even over many miles. Thanks Ruth..I miss you and Glen and so wish you were close by right now. How kind of you Marsha. We all miss you.